Although this book is still in stock for schools that are still using it for their courses, it has been replaced by Murach’s ASP.NET 4.5 with VB 2012. This book is the fourth edition of our ASP.NET text, which has been a favorite at colleges, universities, and community colleges ever since the first edition came out in 2003. It is designed to teach web programming with ASP.NET to anyone who has a set of skills comparable to those in the first two sections of Murach's Visual Basic 2010. Unless your students are still using Visual Studio 2010, though, you should upgrade to the latest edition of this book. This book is still in stock for schools that are using it. However, our current ASP.NET book is Murach’s ASP.NET 4.5 Web Programming with VB 2012, which is a much better book. All of these come with everything your students need to develop ASP.NET 4 applications, including the Visual Studio development environment, version 4 of the Microsoft .NET Framework, Visual Basic 2010, a built-in web server for testing ASP.NET applications, and a scaled-back version of SQL Server called SQL Server Express. Both of these products are free. And together, they provide all of the components in the full editions of VS 2010. 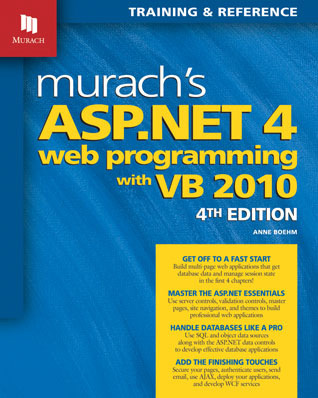 Murach’s Visual Basic 2010 is the perfect companion to our ASP.NET 4.0 book. It presents the Visual Basic programming skills that are needed for developing ASP.NET web applications. It is the perfect Visual Basic reference for an ASP.NET course. It is designed to work hand-in-hand with our ASP.NET book. And if you’re looking for a better book for your Visual Basic programming course, it’s definitely worth reviewing the latest edition, Visual Basic 2012.